Eggplant (Solanum melongena) is a species of nightshade commonly known in British English as aubergine and also known as melongene, garden egg, or guinea squash. It is known in South Asia, Southeast Asia and South Africa as brinjal. It bears a fruit of the same name (commonly either "eggplant" in American, Australian English and sometimes Canadian English, or "aubergine" in British English and Canadian English) that is widely used in cooking, most notably as an important ingredient in dishes such as moussaka and ratatouille. As a member of the genus Solanum, it is related to both the tomato and the potato. 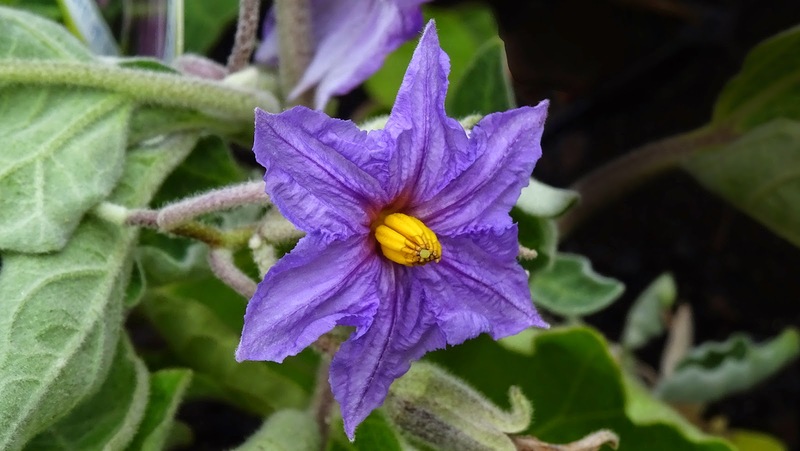 It was originally domesticated from the wild nightshade, the thorn or bitter apple, S. incanum, probably with two independent domestications, one in the region of South Asia, and one in East Asia. The eggplant is a delicate, tropical perennial often cultivated as a tender or half-hardy annual in temperate climates. It grows 40 to 150 cm tall, with large, coarsely lobed leaves that are 10 to 20 cm long and 5 to 10 cm broad. Semi-wild types can grow much larger, to 225 cm with large leaves over 30 cm long and 15 cm broad. The stem is often spiny. The flower is white to purple, with a five-lobed corolla and yellow stamens. The egg-shaped glossy purple fruit has white flesh with a meaty texture. The cut surface of the flesh rapidly turns brown when the fruit is cut open. On wild plants, the fruit is less than 3 cm in diameter, but very much larger in cultivated forms, reaching 30 cm or more in length. The fruit is botanically classified as a berry and contains numerous small, soft seeds which are edible, but have a bitter taste because they contain nicotinoid alkaloids (being a relative of tobacco). how were the famous fireworks this year? Wish we could get a glimpse of them on our TV screens. Never knew that aubergine was related to the tomato/potato group. [take away the yellow center and it looks like a clematis].I love the decorative species in that family too. Oh, this flower is beautiful ! The flower is very pretty. Happy New Year! Happy New Year! There aren't many flowers here at this time of the year. But, SOON! Happy New Year! Learned something today. Thanks for hosting this beautifully photographed and informative meme. What a wonderful blossom in these grey January days! Lovely color point during this grey days. Thanks a lot. Wow, a very beautiful bloosom of a vegetable. I never have saw it.